Getting your child to brush their teeth may be a fairly easy undertaking. The challenge however is getting them to brush their teeth the right way. Yet it still comes as a surprise when parents learn that their child is not brushing their teeth as well as they could be. Thankfully most oral care mistakes are easy to fix by simply going back to the basics and following a few simple steps. 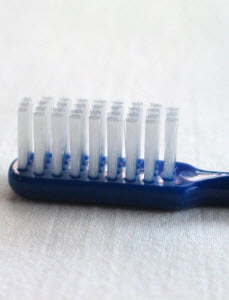 The size of the brush head is extremely important for children because they have much smaller mouths. Tooth brushes are available in many different sizes including the size of the head and the thickness of the handle. If you are unsure which brush is the right one for your child, ask your Smile Reef pediatric dentist for advice. One of the most important things and one that your dentist will insist upon is that the toothbrush you select for your child should always have soft bristles. Why? Because the bristles need to flexible enough to remove bacteria and loosen plaque from the teeth and gums. Many parents believe that the harder the bristles, the more thoroughly they will clean but according to dental care professionals, hard bristles can wear down the structure of the tooth and damage gums. Many parents make the mistake of allowing their child to use too much pressure when brushing their teeth. Teach your child to gently massage their teeth instead of scrubbing. Many children brush back and forth which can cause tiny tears in the gums. Instead teach your child to begin at the gum line and go up and down in small circular motions. Turn the daily chore of brushing into a game by setting an egg timer or using your cell phone to play your child’s favorite tune. Your average song plays for about to 2 to 3 minutes which turns out is the perfect amount of time to remove food particles and plaque. Bacteria have a tendency to collect where teeth meet the gum line; unfortunately the area of the tooth just under the gums is one that is often missed during your child’s brushing routine. Brushing should include the entire surface of the tooth including under the gum line. Your Smile Reef pediatric dentist recommends teaching your child to angle the brush at 45-degrees before brushing against the gum line in circular motions as they move up and down the tooth. Don’t forget to teach your child to brush their tongue as part of their daily dental care routine. Most of us are guilty of concentrating on the outside surface of the tooth that can be seen, while neglecting the tongue side or inside surface of the teeth. According to dental professionals this is the most common oral care mishap that we pass on to our children. Plaque build up left sitting on the inside surface of the tooth will cause inflammation along the gums and often turn to calculus (hardened plague) which can only be removed by your dentist. For more information regarding pediatric dentistry, preventative cleaning, and dental exams, contact the knowledgeable experts at Smile Reef Pediatric Dentistry today. Baby teeth are not a permanent fixture; they will all eventually be lost and replaced with permanent teeth. So why do so many professionals recommend starting oral care in infancy before the teeth even come in? The answer is simpler than you might suppose. 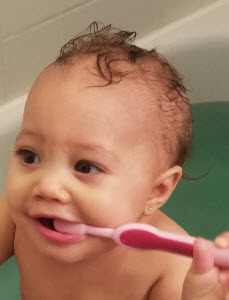 Today, we at Smile Reef would like to expound on why it is important to give your babies oral care before, during, and after the baby teeth stage. Pediatric dentists possess two more years of postdoctoral training and are well versed in caring for the baby teeth for patients from the time they are infants until they are in their teens. You might be asking why an infant needs oral hygiene does at all when they have no teeth. There are several benefits to ensuring an infant finger or baby toothbrush is included in your infant kits. The biggest advantage is using a soft bristled, newborn-sized toothbrush to remove the formula residue from off their gums, tongue, and surrounding mouth. This removes any lingering bacteria and gets them accustomed to brushing their teeth early in life. The primary teeth, or baby teeth, serve several purposes during the formative years. From the moment these teeth grow in, children use them to learn how to speak and they are obviously required for proper eating and chewing. Additionally, the primary teeth provide the spacing requirements for the eruption of the permanent teeth and to ensure the correct development of the muscles and bones in the jaw. That is why there is strong emphasis on dental hygiene for infants and toddlers. Children can become accustomed to using a small dab of fluoride toothpaste and a small toothbrush at an early age. Most children learn by watching, encourage their teeth-brushing habits by doing it alongside them. At about 6 years of age, a child’s permanent teeth begin to make an appearance. Generally, the first teeth that appear are the lower front teeth and the molars. By the age of 14, excluding the wisdom teeth, all the permanent teeth will have erupted. Dental care is imperative in the early years in an effort to minimize or even prevent orthodontic issues and promote optimal growth. When Does a Child First Go to the Dentist? Though we recommend beginning oral hygiene practices for your infant starting at day 1, it is encouraged you book their first dental visit around the 1st birthday. X-rays do not start until later, but that first visit is a good introduction to pediatric dentistry as well as gives the professional an early start on proper development. Dental X-rays are one of the primary diagnostic tools used in the industry, below you will see the breakdown of your child’s x-rays. Occlusal X-rays: The occlusal x-ray, usually only need to be taken once, helps determine the development of the upper and lower front teeth. The image permits us allows the dentist to assess the formation of a child’s permanent teeth beneath their baby teeth, which is frequently taken at around 3 years old. Bitewing X-rays: Bitewing x-rays are used to detect cavities and are taken every 6 months to monitor early detection. The x-rays are usually included children 3 or 4 years of age and are a part of regular professional dental care. Additionally, these x-rays help the pediatric dentist locate any caries that have developed between the teeth. With the help of early oral hygiene maintenance at home and with pediatric dentistry, your child can benefit from having well developed and cared for teeth well into adulthood. 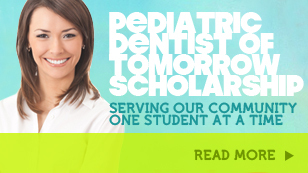 If your child is due for an exam in the Las Vegas, Nevada Valley, contact Smile Reef today to make your appointment!